I am so excited to share the reveal of the completed fireplace! 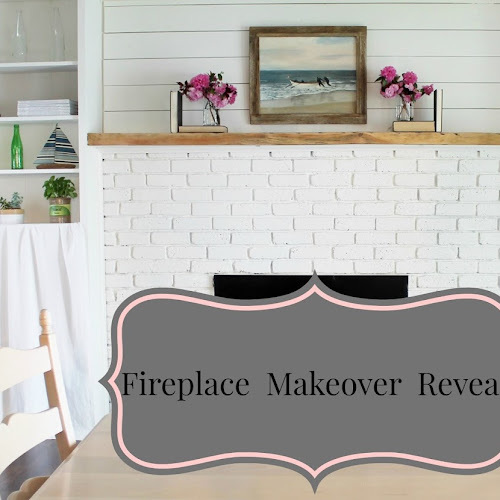 This makeover came together in a series of four projects! First was gathering inspiration. next sanding, then picking the paint color and finally installing the plank wall. 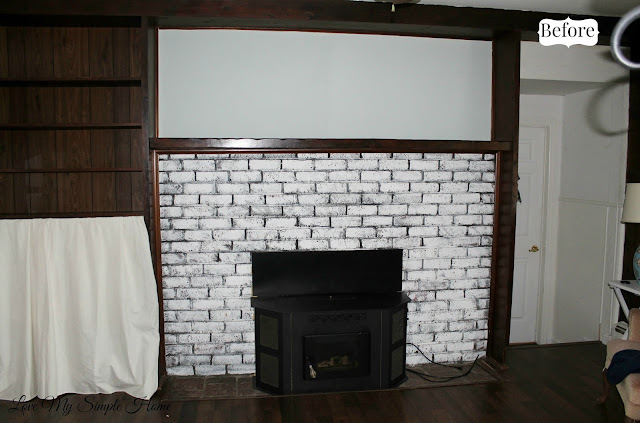 The entire fireplace was painted with White Dove in an eggshell finish by Benjamin Moore. And if you have any questions regarding this makeover ask away! Wow! What a difference! It is so pretty now, and I bet the room feels much larger. Great job! Thanks Melissa you are so right the room does feel larger! Thanks so much for the visit. Have a great weekend! What a difference! It looks beautiful! Wow! What a difference paint makes! 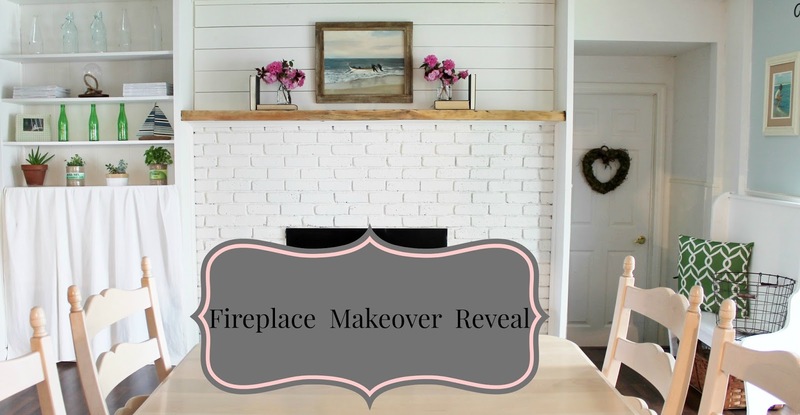 Your fireplace and surrounding wood looks fabulous! Thanks Mary you are so right, paint really makes a difference! Thanks for the visit. Julie, that looks great! I know y'all are enjoying the change! Was it hard to paint the bricks? I've heard it's hard to cover them b/c they absorb so much paint. Anyway...beautiful job! Painting the brick was the hard to do. Like you said the bricks absorb the paint. I used an old paint brush and loaded up the paint real good then brushed it on, gave it several coats. For in-between the bricks I used a small paint brush. Boy my hand was tired after all that painting! We are enjoying the change. Thanks for the visit! Wow! What a great before and after. Your fireplace is beautiful now. Great job. Thanks Sherry, it was a lot of work, but well worth it! Thank you for the visit. Wow, simple changes made such a dramatic improvement! I wish I had a knack for that!! Thank you so much for taking the time to visit my blog. We are enjoying the change! Glad you stopped by. That is a really amazing transformation! I love the colour scheme. It is so modern and pretty. Congrats on all your hardwork paying off. Thanks so much Lauren! It took some time to get it to look like this, but it was all worth it. Thank you so much Cindy for the feature at Amaze Me Monday! This looks fantastic! It's like your wall was made for that treatment to begin with. Great vision and I love the end result! Thank you Stacey, I'm so glad you stopped by for a visit! The makeover was a dream for a long time, I am happy with how it turned out. This is wonderful. I found you through the WOW party. Great makeover and cute blog. Thank you Katie for taking the time to hop over to my blog for a visit!